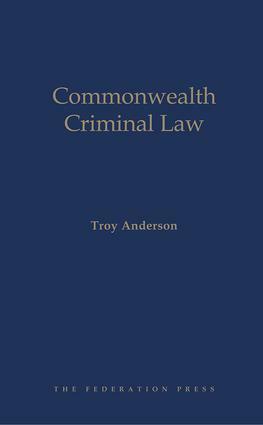 This wide-ranging and timely text covers significant areas of Commonwealth criminal law, including corporate crime, social security and tax fraud, drug importation, money laundering, and offences involving the internet and terrorism. It also deals with the special Commonwealth sentencing provisions provided for by the Crimes Act 1914 and analyses how criminal liability for such offences must be proved under the Criminal Code. The work is designed for practitioners and students alike. Troy Anderson was admitted to the New South Wales bar in October 2007, having previously practised as a solicitor, including for two major national law firms, between 1998 and 2007. Although specialising in international transport and trade law, it was while representing a series of foreign fisherman who had been prosecuted for illegally fishing in Australian waters by the Commonwealth that Troy was first exposed to Commonwealth criminal law. The experience prompted him to join the bar, where his areas of practice are commercial law and criminal law, regularly appearing for the Commonwealth Director of Public Prosecutions in summary and indictable prosecutions, as well as for defendants. Troy also acts extensively for clients in the road transport industry.